Who Should Buy a Lightweight Rollator? Sometimes, canes or walkers simply aren’t the best option when it comes to getting around. Rollators make it easy to walk from point A to point B with ease for the mobility impaired, offering more stability than a cane and a smoother ride than a walker. The wheels that are attached to each leg of a rollator allow you to walk quickly and efficiently without straining yourself. Many models also have a built-in seat for when you need the occasional rest. A lightweight rollator frame can help to improve your stamina, making it easier to keep moving all day long. Lightweight rollators are ideal for frail individuals or those grappling with health and mobility issues, such as the elderly or the hospitalized. They are easy to move and less likely to cause strain to muscles or joints. Even if you are an active adult, you still may want to look into lightweight rollator options. They are highly portable, allowing you to take your rollator with you whenever you head out of the house, whether you’re just driving to the grocery store or visiting family in a neighboring state. 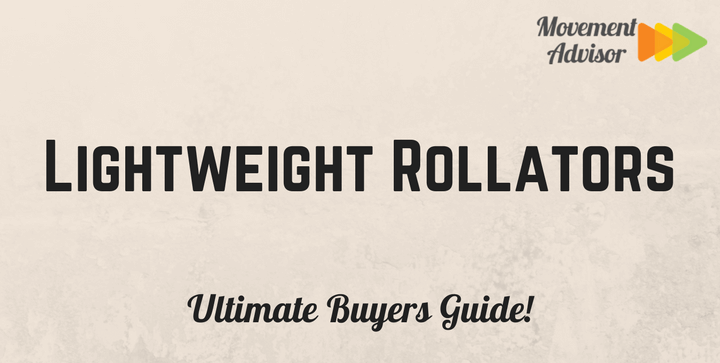 While you may be tempted to gravitate towards heavyweight rollators, lighter models offer a variety of benefits that can make your day-to-day life a little bit easier. Maneuverability- It’s easier to push and steer a lightweight rollator, especially for mobility impaired individuals. Three wheeled designs are even easier to guide and turn. Price- Small, lightweight rollators tend to use less material and are often cheaper than their heavy-duty counterparts. Stamina- Pushing around a lighter rollator all day means that you aren’t working your muscles as hard, which allows you to keep moving for longer. Storage- A smaller rollator won’t get in the way when it’s not in use, as it fits better in a corner or closet. Many lightweight rollator models are foldable to improve their portability and reduce the amount of space they use. Durability- Even though lightweight rollators aren’t as bulky as other heavier models, they can withstand daily wear and tear and last for years at a time. Aluminum and carbon fiber are popular frame materials that are both strong and lightweight. One of the most important things to consider when choosing a lightweight rollator is its weight capacity. Certain rollator models cannot tolerate heavy loads, and it’s important that the rollator you decide on is able to safely bear your weight when sitting or standing. Depending on your size, you may want to look for rollators beyond the standard options. Even though many rollator models have adjustable handlebars, they can still prove to be too high or too low for comfort. Petite individuals may have a more enjoyable walking experience using a junior rollator, while people above the average height may want to look for a tall rollator. You should also look for a rollator that is stable, especially if you plan to use it as a seat. While three wheels can make a rollator lighter, it may also make the device more prone to tipping. If you’re looking for stability, it’s best to look for a four-wheeled walker made of a light, durable material. Many lightweight rollators are built to fold into compact configurations that make them easier to store when not in use. A compact rollator is also easier to carry when you’re heading out of the house. If you are looking at which lightweight rollator might be right for you, we’re here to help. These are our favorite lightweight rollator options available on the market right now. This elegant, top of the line rollator boasts a carbon filter frame that’s exceptionally strong while still being lightweight. The entire Nitro Elite assembly weighs just 14.5 lbs, light enough for most individuals to easily move and carry. Despite its meager weight, the Nitro Elite is able to carry up to 325 lbs, which is more than most other rollator models. It can also accommodate people of various heights, with handles that adjust from 33.25” to 38.25” at just the push of a button. The frame of this rollator is collapsible, allowing you to easily fold it to fit in your car, crawl space, or anywhere else that you might need to store it. Within just minutes, you can collapse the device’s seat with one hand while bringing the handles together into a sleek, compact shape. The Medline Freedom Lightweight Rollator weighs only 11 lbs, but don’t let its small size fool you. This versatile gem can support individuals from just 4’11” all the way up to 6’4” users, with a frame that can hold up to 250 lbs. Not only is this rollator model tough, but it’s also comfortable. A padded seat and a cushioned backrest allow you to sit in comfort whenever you need to stop for a rest while walking. There is even a convenient storage bag under your seat for your wallet, purse, snacks, or other personal belongings. When it’s not in use, the Medline Freedom Lightweight Rollator folds up to fit into most storage spaces. A detachable shoulder strap makes it easy to carry the device around and out of the house. This three-wheeled rollator is by design lighter than many of its four-wheeled counterparts. The Duro-Med Folding Walker features a swiveling front wheel for optimal maneuverability and two wheels at the back that add stability. The narrow design of this rollator lets you use it in almost any indoor or outdoor setting without any problem. You can also disassemble and fold the device when storing it to save space. A roomy, detachable basket at the front of this model makes it easy to carry shopping bags and more as you travel without straining yourself, while a secure nylon bag attaches to the back of the assembly to protect your more valuable belongings. The Drive Medical Aluminum Foldup Rollator is a well-built and economical choice when it comes to lightweight walkers. It’s relatively inexpensive, yet durable enough to last for years. A hidden, zippered pouch under the seat provides a secure place for your bags and valuables. The seat itself is cushioned, as is the device’s removable backrest. You can fold the backrest up or down for more room, or even remove it as needed. When the backrest is removed, the rest of the frame is able to fold into a flat shape for easy transportation and storage. In its folded form, this lightweight roller barely takes up any space. This appealing little rollator boasts a sleek, compact design and an aluminum frame weighing only 17 lbs. A choice of vibrant colors, including titanium, jet black or lavender, add a little bit of flare to the HealthSmart Euro Style Rollator. The design also features a cane holder and a storage tote. The Euro Style Rollator holds up to 300 lbs, and it can accommodate a variety of heights with its adjustable handlebars. Depending on how tall you are, you can set the handles between 31” and 36” above the ground. Oversized 8” front wheels and 7” back wheels give this device a smooth ride as it rolls across all terrains, including carpets, sidewalks, grass, gravel, and more. You can fold this rollator up and take it just about anywhere with you, allowing you to stay active as you join friends and family on outings and adventures.